From morning jog, running around for household chores, attending meetings to shopping – your feet take the beating. It’s only natural that they crave some TLC too. So go ahead and return the favor with a good foot scrub. Soothe, relax and heal your feet with the help of these 10 best foot scrubs. This scrub has a cream base rather than a soap base, which gives your feet deep moisturizing and keep them silky smooth. Being whipped, this scrub has an excellent consistency and can wash off easily. Buy This Now. This all-natural foot scrub with dead sea salts and tea tree oil is antiviral and antifungal. It not only exfoliates but also helps in treating many foot problems. It also has Jojoba Oil, Rosemary Oil, Eucalyptus Oil, Spearmint Oil & Peppermint Oil. All these essential oils add to its healing strength. This foot scrub ensures that your feet are healthy and happy. Buy This Now. This foot scrub has ingredients like pumice to exfoliate and tackle hard skin. It also contains anti-bacterial and disinfecting properties that can heal cracked and callused feet. Peppermint and spearmint oils purify the skin and promote new cell growth. Buy This Now. This herbal foot scrub combines the antibacterial and healing properties of a Vitamin C rich Fenugreek. Jojoba seed grains and walnut in this foot scrub exfoliate the skin. And Kokum Butter, rich in Vitamin E, acts as a moisturizer. Buy This Now. Infused with the refreshing Peppermint essential oil, this foot scrub exfoliates your feet, removes the dead skin cells and nourishes your skin. Buy This Now. This foot scrub has cocoa butter which revitalizes while exfoliating tough skin. It buffs and polishes rough, dry patches on heels and soles. This unique formula with Vitamin E moisturizes and soothes tired feet. Buy This Now. This exfoliating foot scrub is made out of natural sugar which exfoliates the tough skin of your feet. Organic Shea butter in this foot scrub moisturizes them. Buy This Now. This gel-based foot scrub contains the exfoliating extract of pumice, a volcanic stone to slough off the dead skin. Peppermint helps cool your skin and has a relaxing effect. Buy This Now. This foot scrub is a herbal concoction formulated with earth pumice granules and Australian Tea Tree Oil. Other soothing botanicals of this foot scrub moisturize after exfoliation. Buy This Now. 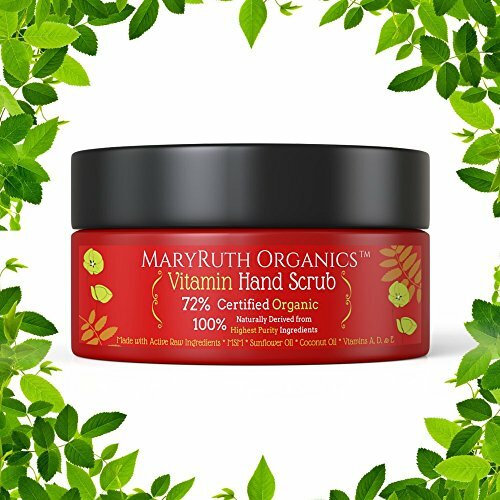 This foot scrub from MaryRuth Organics is formulated with organic content Vitamins A, D, & E and MSM to give the skin natural nutrition and rejuvenating properties. This foot scrub also alleviates muscle pain and soreness. Consisting of sugar particles, it’s a good exfoliator. Buy This Now.